Chapman Dodge Chrysler Jeep Ram and Chapman Chrysler Jeep are ready to take on the new year with new models, including one unlike any other. In late November, Jeep unveiled the rebirth of the Jeep truck, the all-new 2020 Jeep Gladiator. Chapman Dodge Chrysler Jeep Ram and Chapman Chrysler Jeep are ready to take on the new year with new models, including one unlike any other. In late November, Jeep unveiled the rebirth of the Jeep truck, the all-new 2020 Jeep Gladiator. Available in four different trims, the Sport, Sport S, Overland and Rubicon, the Gladiator is guaranteed to raise eyebrows not only for its looks but its performance capabilities. The trail-rated Gladiator is soon to be the most off-road capable midsize truck on the market, with standard 4×4 capabilities, lockable wide track axles, an electronic disconnecting front sway bar and 33-inch all-terrain tires. The available forward-facing TrailCam off-road camera even helps drivers as they trek through the rugged trails. With a best-in-class payload of up to 1,600 pounds and towing capabilities maxing out at 7,650 pounds, Gladiator owners can now bring their boat, ATVs, dirt bikes or any outdoor toy that will make the adventure complete. Interior features include leather-trimmed seating and the available 8.4-inch touch screen with Uconnect 4C NAV. Compatible with Apple CarPlay support and Android Auto integration, the Gladiator makes it easy to seamlessly connect to personal devices. Some unique features specific to the Gladiator include the industry-exclusive detachable Bluetooth wireless speaker, a fold-down aluminum frame windshield and a removable rooftop, making it the only open-air pickup truck on the market. 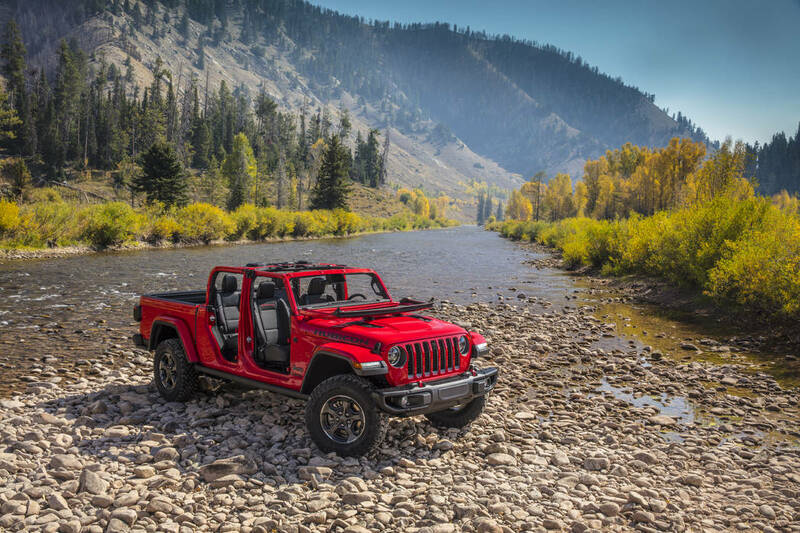 The available hard-top and soft-top options allow owners to be one with nature for the ultimate experience on their next adventure. Chapman is expecting the Gladiator to hit showroom floors this spring.